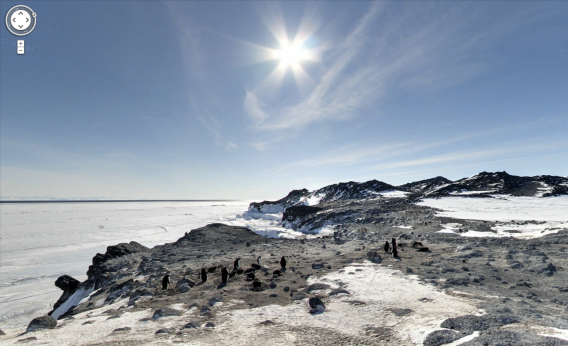 Google’s new 360-degree panoramas of landmarks in Antarctica include the Cape Royds Adelie Penguin Rookery. Two years ago, Google Maps took its Street View feature to a land with hardly any streets: Antarctica. Today it is offering a fuller picture of the icy continent via 360-degree panoramic images as part of its World Wonders project. The new images, which Google announced on its blog this morning, include landmarks such as Ernest Shackleton’s hut, the ceremonial South Pole, and a penguin rookery. The views are gorgeously lifelike—you can practically smell the penguin poop through your browser. No, Google didn’t haul its Street View van (or trike) down to Antarctica. Instead, it captured the panoramas with a tripod-mounted fisheye camera, the same equipment it uses to show the interiors of hotel rooms and restaurants through its Business Photos product. With this access, schoolchildren as far as Bangalore can count penguin colonies on Snow Hill Island, and geologists in Georgia can trace sedimentary layers in the Dry Valleys from the comfort of their desks. “Remember when Google was a search engine?”, TechCrunch editor Alexia Tsotsis asked in a recent piece that looked at whether the company had lost its focus over time by putting “a finger in every pot.” She wondered if the waywardness began with Google Earth. Maybe—but if so, here’s to waywardness. 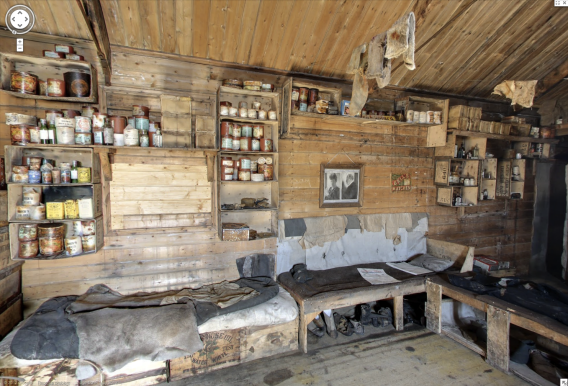 Google’s new panoramas include one of the hut that Ernest Shackleton built on his first Antarctic trip, in 1908. 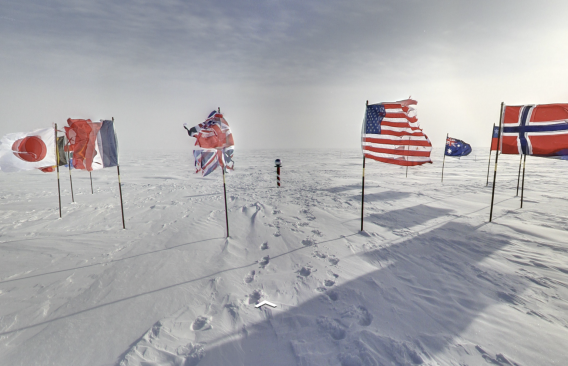 Flags flying at the ceremonial South Pole.